With taxseason upon us (April 15th will come sooner than you think), it is time to think about expenses, deductions and the other items that need to be included in your family's timely filing. After all the documents and receipts have been collated and filed, hopefully a refund will be in your cards. Which leaves many of us to the question, what will you do with that refund? A great option to control spending all of your refund (or more than your refund) is a Visa Prepaid card. With a Visa Prepaid card, you can't overspend. Your limit is set. There is no more "a few more shoes, purses or jeans are ok and I'll pay it off next month.” The pre-determined amount of money can make you more conscious of your spending habits. Personally, I like Visa Prepaid cards as a way to plan out my spending. I notice with a Visa Prepaid card that I watch sales to maximize my card. I know that once my amount is depleted that I can't spend. True, I might buy items that aren't typical purchases, but I think about the purchase. There are no impulse purchases or blind spending. Most importantly, I'm not racking up debt on a credit card.Using a Visa Prepaid card is like buying with cash, but with more security and payment options. From online to my local grocery store, this card is a great way to pay. Adding your tax refund to a Visa Prepaid card is simple and easy. Did you know that a Visa Prepaid card can get your refund to you faster than a check? At stores or online, you will be on your way to putting your refund to good use. Plus, if your Visa Prepaid card is lost or stolen, it can be replaced. For more information, please watch this video. To spark your interest even more, Visa Prepaid is giving a chance to win groceries for one year your family. 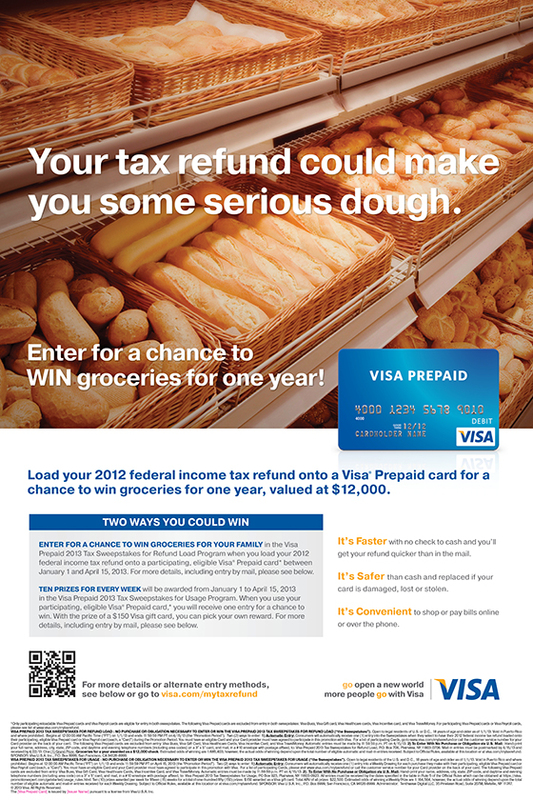 This $12,000 value giveaway is available when you load your 2012 Federal income tax refund onto participating, eligible Visa Prepaid cards between January 1 and April 15, 2013. When you use your participating, eligible Visa Prepaid card you will receive an entry for a chance to win one of ten $150 Visa gift cards given away weekly. With the prize of a $150 Visa gift card, you can pick your own reward. This tax season, give yourself a little more with that hard-earned refund. Get a Visa Prepaid card and have the possibility to gain more. Disclosure:I am blogging on behalf of Visa Prepaid and received compensation for my time from Visa for sharing my views in this post, but the views expressed here are solely mine, not Visa’s. Discover more at http://www.VisaPrepaid.com or join the Visa Prepaid community at http://www.facebook.com/VisaPrepaid. 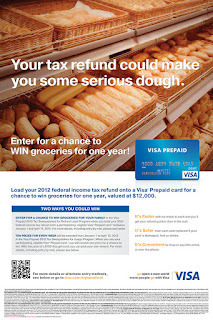 Such a great idea to put your tax refund on a Visa Prepaid card! I used to use prepaid cards when I first moved out on my own. I had one for each spending category - to help me learn how to budget. When the grocery budget card was empty - it was top ramen until the end of the month, lol. Prepaid cards really are pretty cool! It gives you the benefit of having a card, but the safety of not overspending or going into debt. They are pretty sweet. That is a really great alternative. Thanks so much for sharing! Thanks for the giveaway info too, sweet! I saw this option when I did my taxes this year! Great concept.